“What is it about feeling dirty that shames us into silence and disgust?” asks director MEGHNA HALDAR in the feature documentary DIRT. From the slums of Kolkata to Vancouver’s Downtown Eastside to a barbeque joint in Central Texas – everyone has a different story. 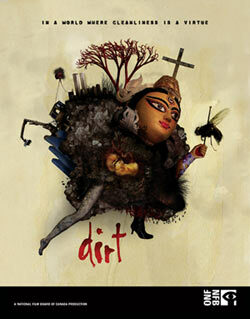 DIRT isn’t just a four letter word, it contains a world of meaning spanning the divine to the profane. A quixotic odyssey into all things unclean, featuring animation to make Hieronymus Bosch blush, tracks from GODSPEED YOU! BLACK EMPEROR and an experimental soundscape by CLINKER, DIRT digs deep to illuminate the positively filthy experience of being human.